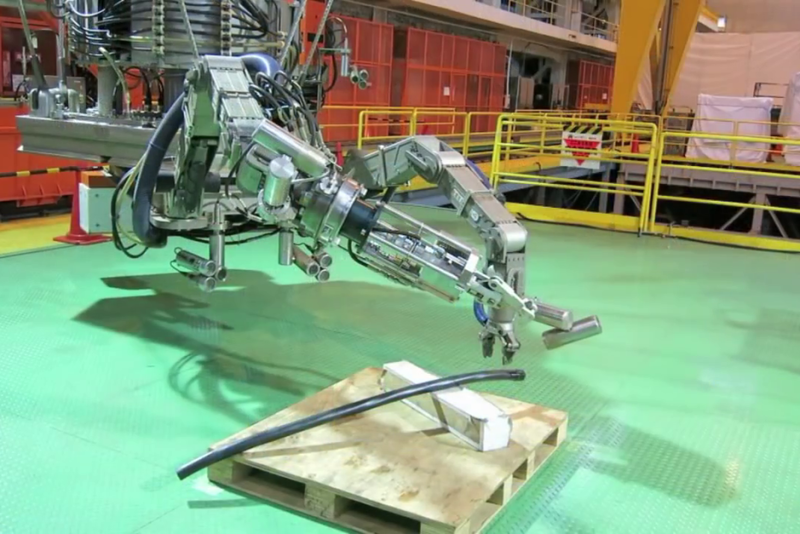 The remotely operated robot has two arms to grab and cut debris, and a third arm to pick up fuel rod assemblies. Toshiba has unveiled an amphibious remote-control robot to remove spent fuel rods from the highly radioactive reactor 3 building at Japan’s crippled Fukushima Daiichi nuclear plant. The device is scheduled to begin extracting 566 fuel-rod assemblies in the 2017 financial year, the Japan Times reported. Toshiba constructed reactor 3, which is still so radioactive that when the ABC toured the plant in February 2015, it was strictly off-limits because entry would mean instant death. At the time, Kenichiro Matsui from the Tokyo Electric Power Company (TEPCO) said the company did not know the exact situation in detail. “We need to develop robotic technology with help from around the world to know the real situation,” he said. Reactors 1, 2 and 3 are being controlled by pumping in water to cool them and prevent further nuclear meltdown, resulting in 500,000 litres of radioactive water being extracted and stored every day. Radioactive water has leaked into the sea off Fukushima on several occasions. Reactor 4, which was not operating when an earthquake triggered a tsunami in March 2011, had the last of its 1,535 fuel rod assemblies removed in December 2014. Low levels of radiation allowed workers to stand at the pool in reactor 4 to monitor the fuel-rod removal, but that will not be possible in reactor 3, which was damaged by a hydrogen explosion and suffered a meltdown. The removal of fuel rods from reactor 3 will be “more difficult since it will have to be done completely remotely”, TEPCO official Isao Shirai said. Toshiba’s device has multiple cameras allowing workers to see from multiple angles, two arms that can pick up and cut debris, and a third arm designed to grab fuel rod assembles. TEPCO said it hoped to bring radiation levels down to 1 millisievert per hour, which would still be too high for long-term work at the site. Australians are exposed to only 1.5 millisieverts per year on average, more than half of which is from medical X-rays, according to the Radiation Protection and Nuclear Safety Agency. Japan closed all nuclear reactors in 2013, but began bringing them back online in August 2015.